LAS VEGAS – Aug. 29, 2017 – Barrett-Jackson is ramping up for a can’t-miss 10-year celebration of its Las Vegas Auction with an enviable docket of collector cars and events at the Mandalay Bay Resort and Casino, Oct. 19-21, 2017. The docket for Las Vegas’ premier automotive lifestyle event will include a wide array of highly desirable and sought-after collector cars, including the ’07 Ford Shelby GT Concept Car #1 (preview), an ’05 Mercedes-Benz SLR McLaren with under 7,500 actual miles (preview) and a professionally restored ’70 Oldsmobile 442 Convertible (preview). For the second year in a row, Barrett-Jackson will host its not-to-be-missed kickoff party at Drai’s Nightclub on Wednesday, Oct. 18. The invite-only party – open to consignors, bidders, sponsors and invited guests – will provide an electric start to the auction as guests celebrate at the world-renowned club overlooking the famous Las Vegas Strip. The collector car and automobilia auctions begin Thursday, October 19, along with a wide variety of displays, exhibitors and activities for the whole family. This year’s Las Vegas lineup will include a wide assortment of vehicles designed to cater to the needs of new buyers and veteran collectors alike. Among the featured vehicles is the ’07 Ford Shelby GT Concept Car #1 (preview),which was the first pre-title small-block Shelby built since the late 1960s. This Shelby GT, CSM07GT01C, served as Shelby American’s development car and was used in the company’s publicity and marketing efforts, including as the display model at the car’s introduction at the New York International Auto Show. 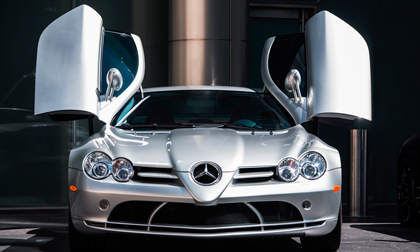 For those seeking a modern luxury supercar, a 2005 Mercedes-Benz SLR McLaren (preview) is finished in high-visibility metallic paint known as Crystal Laurite Silver with a plush red leather interior and just under 7,500 actual miles. Under the hood is a 5.5-litersupercharged V8 with a Lysholm-type twin-screw supercharger that cranks out 617 horsepower and 575 ft/lbs of torque. American cars will also be represented well in Las Vegas, including a ’70 Oldsmobile 442 Convertible (preview), a ’67 Chevrolet Corvette Custom Coupe (preview), a ’57 Chevrolet Bel Air Convertible (preview) and a rare ’68 Ford Shelby GT350 Fastback (preview). The 2017 Las Vegas Auction Preview Docket is available to view online. Advance tickets and All-Week ticket packages are also available at Barrett-Jackson.com. Established in 1971 and headquartered in Scottsdale, Arizona, Barrett-Jackson, The World’s Greatest Collector Car Auctions®, is the leader in collector car and automotive lifestyle events, which include authentic automobilia auctions. The company produces auctions in Scottsdale, Arizona; Palm Beach, Florida; at Mohegan Sun in Connecticut, and Las Vegas, Nevada. With broadcast partners Velocity and Discovery Channel, Barrett-Jackson will feature extensive live television coverage in 2017, including broadcasts in over 100 countries internationally. Barrett-Jackson also endorses a one-of-a-kind collector car insurance for collector vehicles and other valued belongings. For more information about Barrett-Jackson, visit Barrett-Jackson.com or call 480-421-6694.